The U.S. Forest Service estimates that the marijuana it eradicated Friday in a garden near Redstone was worth $8.4 million, the agency announced Monday. The illegal grow site in the Crystal River Valley contained 3,375 plants that were up to 5 feet high, according to White River National Forest supervisor Scott Fitzwilliams. The pot plants were growing on 2 to 3 acres of ground, though not all of it was contiguous, he said. The pot was growing in natural and man-made clearings in an aspen grove. “We estimated this garden’s been here a few years — three, four, five years,” Fitzwilliams said. No arrests have been made and the case remains under investigation. The agency won’t say if it has suspects. A news release from the Forest Service estimated that each plant could have yielded one pound of “processed material” with an average value of $2,500 per pound. At that rate, the garden could have produced marijuana with a value of about $8.4 million, the agency said. The plucked pot plants were flown out by helicopter and dumped in a “sludge pond dump” in South Canyon landfill west of Glenwood Springs. The sludge will ruin the plants, Fitzwilliams said. Law enforcement officers at the site said the marijuana buds were within two or three weeks to harvesting. The site is along Hayes Creek, at an elevation above 8,000 feet — where growing anything can be a challenge because of late frosts in the spring and early frosts in the fall. “That’s why it surprised us,” Fitzwilliams said of the find. Hayes Creek creates Hayes Creek Falls, a popular destination along Highway 133 about two miles south of Redstone. The falls are about 60 miles from Aspen via road. The grow site was about two miles upstream from the falls in an isolated part of the White River National Forest. A father and son who were bowhunting discovered the plants earlier this month. They shared their information with the Pitkin County Sheriff’s Office, which determined the site was on public land in the national forest and forwarded the information to the Forest Service. Investigators found black irrigation pipe leading from Hayes Creek to sprinklers at the pot garden. There was evidence that “benign, over-the-counter fertilizer” was used and that human habitation of the area was only occasional, Fitzwilliams said. One source familiar with the operation quipped that it was the type of grow site that would be expected in the Aspen-area — clean and environmentally friendly. There were no booby traps surrounding the site, but the Forest Service said pot operations still raise concerns about public safety. “Any time you have over $8 million in product, who knows what people will do to protect their investment, if you will,” Fitzwilliams said. 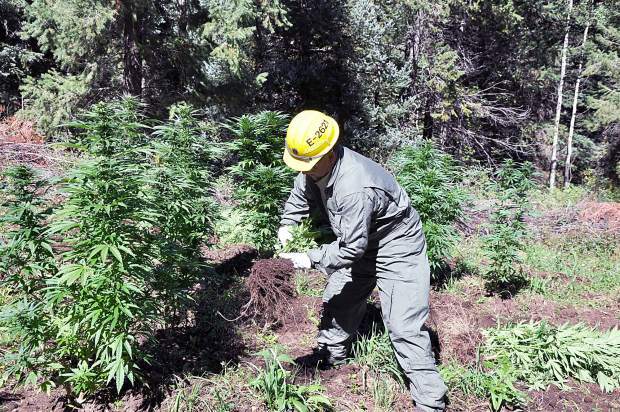 Public and employee safety is a top concern, so eradication of marijuana cultivating sites is a top priority, the Forest Service press release said. The White River National Forest is one of the busiest in the country for recreation visits. “We wanted to get rid of this in a hurry,” Fitzwilliams said. Other gardens found on the forest have been less than 100 plants. The most recent was found four or five years ago near Eagle, according to the White River staff. But Fitzwilliams acknowledged that the presence of the massive site near Redstone indicates gardens could exist in remote areas of the forest. However, he believes Forest Service rangers on regular patrol or forest visitors will discover any operations. “There are so many people out there, sooner or later we’re going to stumble upon them,” he said. The Forest Service reported that Colorado was third among states in the amount of marijuana plants seized and eradicated in 2012, behind California and Washington. Since 2009, 34 illegal marijuana grow sites and more than 65,000 pot plants have been eradicated in national forests in Colorado, according to the Forest Service. Forest visitors are asked to call Forest Service Law Enforcement at (303) 275-5266 if they spot anything suspicious while hiking or camping.